Genuine Black Diamond Solitaire Ring set in 14K White Gold. Drama, luxury and excitement come together in this distinctive diamond solitaire ring from Apples of Gold. A single black diamond brings that rich, dark color exclusive to black diamonds. 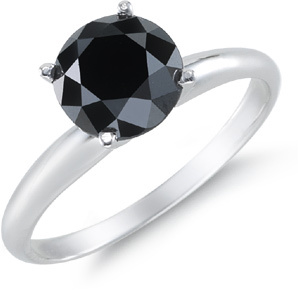 The opulence of a diamond and the depth of a starless night make this black diamond ring truly stunning. The 2.00 carat black diamond is guaranteed to be high quality and is held tightly in place by the 14K white gold setting. The band, also of solid 14K white gold, is the perfect complement to the remarkable stone. We guarantee our 2 Carat Black Diamond Solitaire Ring to be high quality, authentic jewelry, as described above.